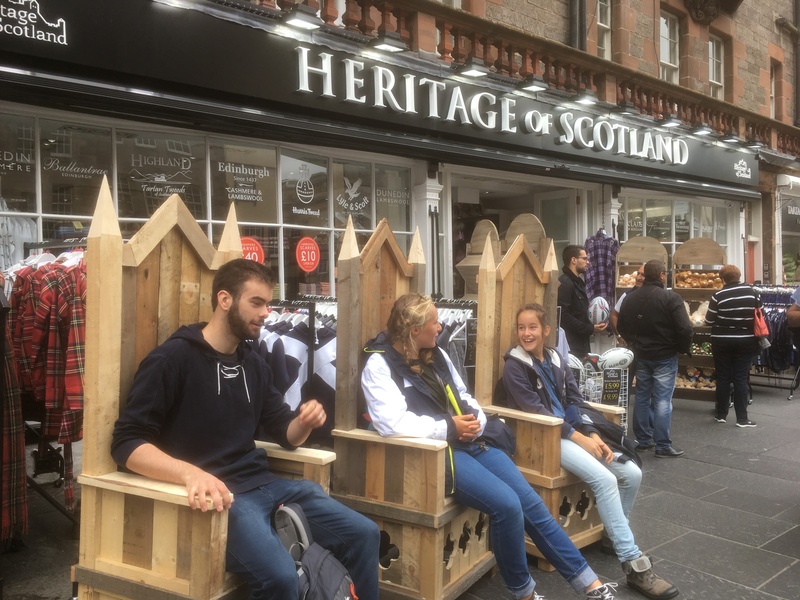 When we first came up with the Throne Chair idea, we did have in mind something which could be used both indoors or outdoors. The first order online, (fittingly to be delivered to the Kingdom of Fife!) was to be as a part of a garden set. This included a table, matching chairs and even a small throne-bed for the cat. We still had no idea how wide the scope of uses a reclaimed wood throne could have. Our throne design has become popular as a Storytelling Chair. Schools and children's charities as far apart as Newcastle upon Tyne and South Wales now have them for this purpose. Hilton Academy in Newcastle even created an Enchanted Garden where two Pallet Earth Thrones are in place inspiring their young readers. Another unexpected scenario was their popularity for weddings. The first couple interested in them for their special day had a Viking themed reception. Among our throne pictures this one is where there's a viking helmet on the table infront of the two thrones. They have also been given as anniversary gifts. One option we offer for a small extra charge is inscribing (either painted or pyrograhed) the thrones. We have also adorned the back of the thrones with a love/unity symbol for a local customer and with a Northumberland crest for an event in Ashington celebrating Northumberland Day. It is no accident that the throne design has an historical overtone. The fenceposts and pallets we recycle to construct the chairs are clearly contemporary in their initial application, however we roughly based our prototype on the Coronation Chair in Westminster Abbey. (Dumbledore's Throne in the Harry Potter movies also seems to be based on this famous seat). Earlier this year the Tread The Boards Theatre Company in Stratford-upon-Avon used a Pallet Earth throne as a prop in their production of Henry V. We have interest from another theatre group for when they put on another of Shakespeare's plays. Finally if you are in the centre of Edinburgh, Lawnmarket Old Time Photos offer customers the chance to get dressed up in some traditional Scottish costume for a photo session. These photos are taken in a specially designed set within the shop where you can sit in state on a Pallet Earth Throne.